The firm of Emile Pernot, now more than a century old, has a direct lineage rooted in the origins of the famous liquor named "absinthe”, and you’ll discover that the story is rather surprising seeing the coincidences! Indeed, the legend says that on Dr Ordinaire’s death, at the end of the 18th century, his precious original recipe for the elixir passed to two Swiss sisters from the Henriod family. They in turn sold the recipe to a Major Dubied from Couvet, who commercialized the product and, together with his son-in-law Henri-Louis Pernod, established the very first absinthe distillery in Pontarlier in 1805. 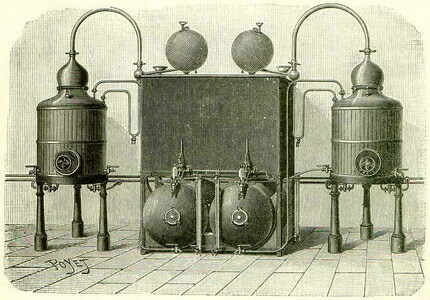 Only 16 liters of absinthe were produced each day by the 2 alembics of this little distillery. Dubied later parted ways with Pernod (who henceforth traded under the name Pernod Fils), and traded under the name "Dubied Pere et Fils". 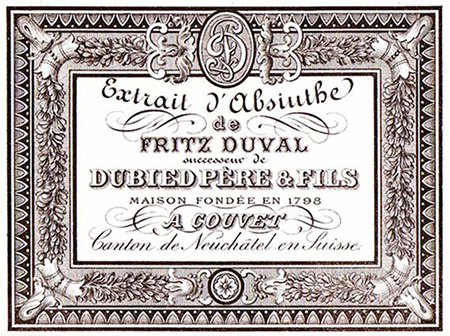 In 1872, Fritz Duval join Dubied and the distillery become "Dubied et Duval". In 1879, his son Henri-François Duval left the company and set up on his own under the name "H.F. Duval". This firm was bought in 1889 by Eugene and Adolphe Parrot and renamed "Parrot Freres". In 1889, the young Emile-Ferdinand Pernot, a native of the Fougerolles region, where he had trained as a distiller, joined the Parrot brothers and together they established "Emile Pernot et Cie” located at 1 rue du Mont in Pontarlier. The first record of the firm at the Trade Tribunal is dated from October 1st 1889. The very first Extrait d’Absinthe label for "Emile Pernot” appeared on October 12th 1889. Emile-Ferdinand also registered many other brands, in particular "Pernot Emile”. His son, Emile-Joseph, a survivor of the trenches at Verdun, later registered the famous name "Emile Pernot”. In 1908, Emile-Joseph Pernot, then 30 years old, joined the Cousin Jeune distillery, located at Le Frambourg in La Cluse et Mijoux, as a foreman and soon after became technical director. 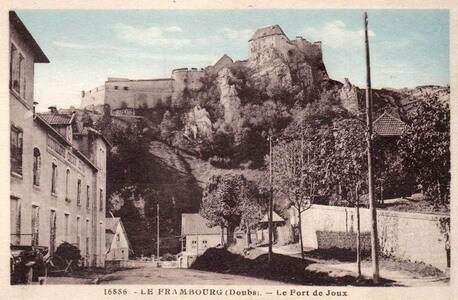 In 1919, on Emile-Ferdinand Pernot’s death, Emile-Joseph took over the company located at 13 rue des Lavaux, and then 2 quai du Doubs both in Pontarlier.His children, Roger-Emile and Georges Pernot started working with him from childhood before carrying on their association by founding the house "Les Fils d’Emile Pernot”. In 1979, Emile-Gérard Pernot, great-grandson of Emile-Ferdinand, took control of the Pernot distillery, and continued until his retirement in January 2005 when he sold the firm to Pierre Beuchet, a Burgundy negociant. 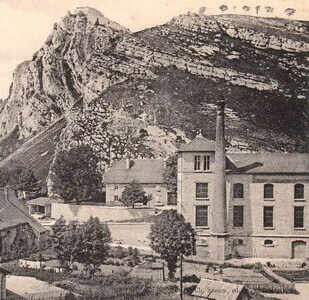 In 2006, the Pernot company bought the famous « Deniset-Klainguer » distillery located on Montrieux street in Pontarlier and established in 1867 by Henri Deniset Jeune. This allowed the Pernot distillery to considerably expand its product range and in particular to incorporate the renowned Deniset-Klainguer sapin (pine-bud liqueur) into its offerings. In august 2009, the distillery moved to the magnificent old Cousin Jeune building in Le Frambourg in La Cluse et Mijoux, at the foot of the Château de Joux, the very same building where the young Emile-Joseph Pernot learnt his trade a century earlier. At the same time, La Cluse et Mijoux-born Dominique Rousselet was appointed Gerant of the distillery, and the well-known absinthe authority David Nathan-Maister joined the management team as shareholder. The circle is now complete: now located in its historic premises the house of Emile Pernot combines a century of tradition and artisanal craftsmanship (and some typically French savoir-faire) with a forward looking and international approach, to bring its expertise in herbal distillation to the widest possible audience. Thanks to Marie-Claude Delahaye for her chapter on Emile Pernot in her book "Pernod 200 ans d'entreprise 1805-2005"
The magnificent century-old copper alembics used by Pernot for their absinthe distillations were made by the famous old firm of Egrot in the early 1900’s. They were specially designed and built for absinthe distillation, and they are the only stills of their kind in operation anywhere in the world. These stills allow the Pernot distillery to produce absinthes of exceptional quality according to methods unchanged for a century.